So goes the famous Gershwin lyric… but it’s not so easy if you’re dealing with a yellow jacket problem. Summer is the season for yellow jackets as they thrive in warm and dry weather. That combination rarely comes outside the summer months here in the Portland, Oregon area. So, when it comes, we all want to be able to enjoy it without pest worries. Here are some of the things concerned homeowners need to know. The yellow jackets most commonly found in the Northwest are the western yellow jacket (Paravespula pensylvanica), the common yellow jacket (Paravespula vulgaris), and the aerial yellow jacket (Dolichovespula arenaria). The queen yellow jacket starts her nest in the spring, starting out really small. If left undisturbed, it can get to the size of a basketball and housing a couple thousand yellow jackets and are at their peak at the end of the summer and early fall. New queens are spawned and go into hibernation over the winter months. The nest is sometimes in the ground, but they can also be suspended on your home. While we don’t want to alarm you, it is important to make a clear distinction between yellow jackets and honeybees. Yellow jackets can be very aggressive. They are more likely to sting people without provocation than bees and those stings are more painful. What’s worse, unlike bees, they can sting multiple times. Stinging is a defense mechanism, and the primary way they feel threatened is through sensing vibration. Everyone knows that disturbing a yellow jacket nest directly poses a danger, but the nest can be disturbed by subtler vibrations, such as a passing lawn mower. They can also be ready to sting through visual disturbances, such as a passing shadow. 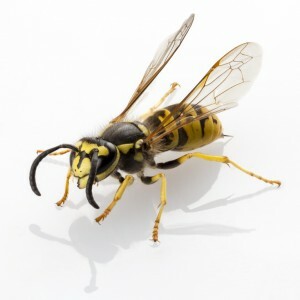 Yellow jackets are also referred to as “meat eaters” since they feed on human food and insects. If you want to minimize your run-ins with them around your home, since they are foragers, you want to keep your property clear of tempting food sources. For instance, when you are outside enjoying an afternoon of barbequing, you should keep food and drink containers covered. Keep trash cans closed tightly at all times and clean your grill thoroughly. While there are DIY remedies for removing a yellow jacket nest from your property, given the inherent dangers, it’s likely better to call on a professional pest control service to get the job done. This is especially true when you think about the fact that some people are allergic to yellow jacket venom, when stings can even be deadly. If you have any questions or concerns, call The Bug Man for a free estimate and consultation.